Lex i has become my little side kick during the day now that Kylee is at school all the time. We have been trying to keep ourselves busy and I can't believe how grown up my baby is. Her phrases keep us all constantly laughing and her cuteness makes us all fight over who gets to eat her. I feel good as she runs to me for protection when Sky and Ky are both attacking...knowing that I always get the amount of cuddles that I need. She is right by my side each morning and has become my shower buddy. She loves to stand on the toilet next to me every day as I get ready and puts on ever y single one of my lipsticks. This is often followed by her asking for each thing that I'm using from moose to my deodorant. Her personality continues to emerge more each day which is also making me have to watch her even closer each day. It amazes me how different each kid can be. Kylee still checks in with me constantly or is nervous to even go up to people she knows to ask a question. Alexis on the other hand is constantly invading even strangers personal space and tends to make a friend or companion where ever she goes. The latest is my institute class as she makes her rounds to people I've never met. As I look back, I'll find her coloring with a missionary, sharing all her toys with an elderly lady, or escaping to who knows where. She is often rewarded with a trip to the mall afterwards and loves going on this tiny merry-go-round and lately it is to see Santa! What was once a scare is now an absolute love! She is obsessed with any dressed up character and can't get enough hugs from them. For example the Hershey characters and the latest is Santa. I think we have visited him over 10x already this season. We enjoyed tagging along with some friends to a field trip at Explorations back in the beginning of October. It was filled with hands on projects and it caused me to realize it was time to engage Alexis in more activities. 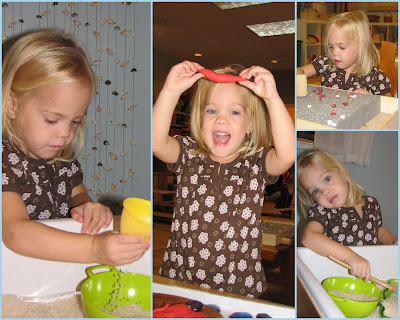 She loved, painting rocks with water, rolling out the clay, building and most of all the rice table! This was one of our first one on one activities and Alexis not in Kylee's shadow at all. I was just overwhelmed with watching every move she made and seeing her in all her glory as she was part of the group. Latest Love: A binky or as she calls it a "pinky" I may have set a new record....child never has used a pacifier and now at 2 1/2 won't go to sleep without her pinky. Let me tell how happy Sky is about this one! What started out as innocent make believe play with her babies has turned into a horrible habit which I guess I will face after the holiday. Tough girl who still shows little pain...amazing how quick she bounces back from injuries which I still is attributed to the NICU. Best Sleeper ever! still so easy to put down and a delight to listen to in the morning. Has her stash of stuff at the bottom of crib and wakes up singing to herself. Sound Impersonator: great at imitating every sound she hears and then asking what's that or impersonates a cry, wine or yell of another child including Kylee. Cracks me up every time. Following Father with her movie lines: I got her going and now she runs on her own, latest cute line is from Grinch..."I don't like em, no I don't" Began with, "Turkey & Sugar"
Following suit as she seeks for the Thrill as well...A recent form of entertainment is using the spare mattress and sofa cushions as a slide down the stairs and for extra speed the silkies are the girls mats! She loves every ride she is tall enough for at Hershey Park and we are glad we've gotten her back twice since we moved...favorite I think is the swings! Lastly, this is a high swing hanging from a tree in our friends backyard...my jaw dropped on this one as I looked over at Lex and Sky! It is so fun to watch her excitement for Life! 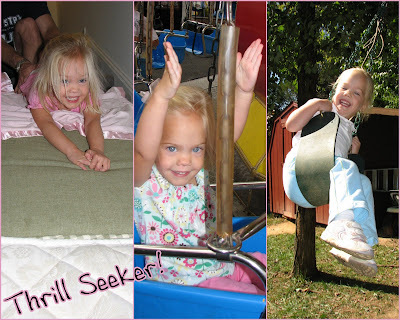 Each activity is met with a "Yeah Yeah Yeah" in a high pitched squeal as she jumps up and down with her arms in the air. After one recent bath she was found like this. All set up with her stuffed animals, in the pop up basket that she found and of course in Kylee's room where we are often hanging out in the evenings. Alexis is frequently found singing or humming a tune. Within minutes of getting in the car she asks for a song and knows so many of them. (every wiggle or beaty primary song) I NEED SOMETHING NEW! I am amazed at how fast she learns the lyrics and remembers the tune. Ky, heard her singing this primary song and asked, "How does she know that?" "From listening to you" Some of Ky's examples I wish I could erase but others I am so thankful for. Alexis learned how to hold the book out and tell these stories from watching big sister constantly pretend to read to her class at home and picked the new primary song up from just listening to us at times. She sang right along with the Primary program a while back while standing in the isle. "Nana nana boo boo stick your head in doo doo"
I'm almost done with this post but I have to mention her music and movement class that just ended. She absolutely loved it. She took the first few weeks to warm up but once the routine was down she would go running down the hall as she heard the opening song and chime right in. She knew it was HER special time as she eagerly watches Ky ever week at gymnastics. She called it, "MY CLASS" and would ask every couple days for it. I was so thankful on the days she had it that I could mention, "today is your class" as she would longingly watch Ky and Dad leave for school and work. She had her friend Chloe in the class and new everyone by name after the second week. She quickly learned many of the songs and several of them are still heard on a daily basis. At times the noise would be too much for her but she would just cover her ears or ask to be held and soon chime back in. 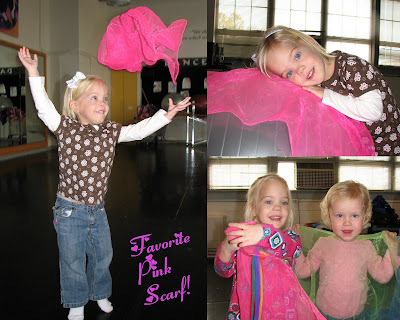 She was obsessed with this pink scarf and many weeks never wanted to leave it behind. I think I bribed her with "Santa may bring you one" at our last class, which reminds me...he better get on that one! I love my "LITTLE LEXI" and all she brings to our family! If any of you made it through this post...WOW! Thanks for putting up with my way over due journal entry. Alexis will be watching these videos of herself over and over! It's so fun to read about her, thanks for sharing it. What a cute and sweet little girl! It is fun having one on one time with the other child. I enjoy my one on one with Justin while Hailee is at school. He still misses her like crazy though. I wonder what he will do when she is gone all day next year. I hope you guys are doing well. It looks like you are, and I love seeing the pictures of your family. You all look great! So fun!!! It's always so wonderful as a mom to watch your child's growing and developing personality...and it looks like Alexis is chalk full of it! Oh I can't wait to see your cute girls again! I love her singing - quite impressive really, but also so stinkin cute and precious! It is so great how much she loves life and gets excited for things. Good job documenting. Oh I miss her!! She is so big and cute! So cute to read about her updates, the girls loved watching her videos, she is a star! she is getting so cute and grown up. i can't believe how much your girls look like you!! Festivities verses mad rush, packing & SNOW!